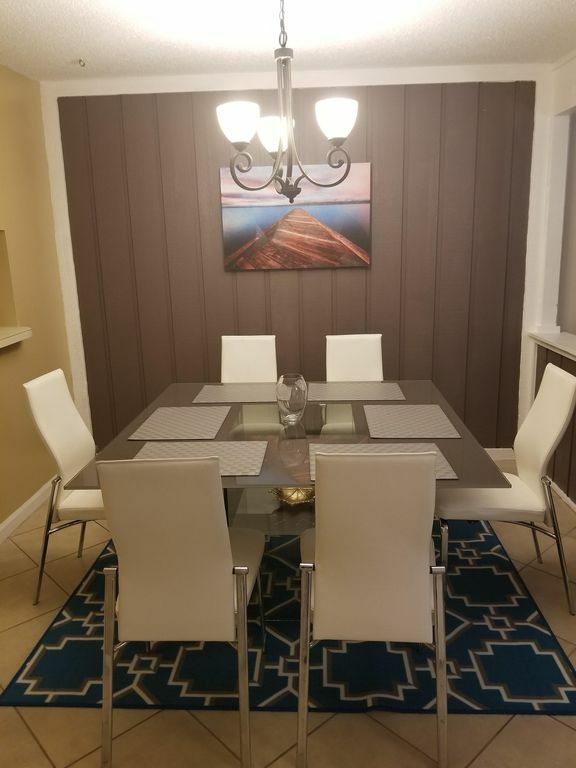 This beautiful condo located near the theme parks, malls, restaurants, dance clubs, outlets. Full kitchen, washer and dryer, 2 balconies with chairs and tables to enjoy Florida weather. Smart TV to enjoy movies, TV shows. Public transportation if you need too. Grocery store, banks, gyms walking distance. 2 Pool in the property to enjoy and tennis courts. Master bath have a walking shower with plenty towels. 6 seat table and breakfast table at the kitchen. Everything that I could have expected and more!!! From the major details to the minor ones that I didn’t even know I needed (until I got there) were accessible to my family and me. Access to the place was easy; the place is beautifully clean and spacious. We could not have asked for anything more. Water pressure: GREAT, kitchen: has EVERYTHING, 2 baths: Came with EVERYTHING, washer/dryer: even had some detergent to use, patio: romantic, living room, WiFi, cable, EVERYTHING and GREAT channel selections. Decor was just right (not too much/ not too little). I will definitely keep this one on my list and encourage others to stay! It’s like THE perfect place like great new place to stay and sooooooo close to Universal Studios it’s crazy (less than 2 miles)!!! We had a great time!!!! Thanks so much for trusting us in your property! Clean, well maintained, good beds. Street noise esp at night. The only negative about the location is SIGNIFICANT noise at night from the adjacent road especially weekends with loud vehicles. Thanks, Travis for you stay and for advice will be provided more pots no problem for your next stay with us thanks again.